Dr. Dwight Burlingame, Glenn Family Chair and professor of the Lilly School of Philanthropy at Indiana University, has been one of the leading thinkers, authors, and reflective practitioners in organizing the field of philanthropy scholarship worldwide. Throughout the development of Michigan’s philanthropic network, and particularly with the start of the Michigan Community Foundations’ Youth Project, Dr. Burlingame was a trusted friend and advisor to the Michigan projects related to education in philanthropy. He possesses an international perspective on the field and has worked closely with the leaders of Michigan’s philanthropic community. He has been diligent in his work, thoughtful about its development, and continues to bring the perspective of a participant-observer to the history of Michigan’s infrastructure. Dr. Dwight Burlingame talks about his career in philanthropy. Dr. Dwight Burlingame talks about the role of trust in the collaborative efforts of Michigan and Indiana. Dr. Dwight Burlingame talks about the remarkable leadership of Russ Mawby and Dottie Johnson. Dr. Dwight Burlingame talks about the change in attitude in higher education regarding philanthropy and academic centers. Dr. Dwight Burlingame talks about Michigan serving as an exemplar for infrastructure organization leadership and community foundations. Dr. Dwight Burlingame talks about Michigan's national and international influence with its infrastructure organizations and focus on youth philanthropy. Dr. Dwight Burlingame talks about world views on philanthropy. Dr. Dwight Burlingame began his postsecondary education at Minnesota State University Moorhead. While there, he studied political science and business, and pursued work as a teacher. Following his time there, Dr. Burlingame attended the University of Illinois where he completed a Master of Science degree in library science. He then sought a doctoral degree in business at the University of Iowa, but after only six months, he was drafted into the army during the Vietnam War. Dr. Burlingame spent two years in the military before returning to work as a faculty member at St. Cloud State University. He held that position for four years before earning his Doctor of Philosophy degree in library science from Florida State University. Dr. Burlingame also completed a post-master’s study program in higher education at the University of Minnesota. After receiving his Ph.D., Dr. Burlingame began working as dean of libraries at the University of Evansville. After four years, he became dean of libraries and learning resources at Bowling Green State University in Ohio. He identifies this time as one of his first forays into the field of philanthropy. As the dean, Dr. Burlingame was involved in helping to raise funds for the university library. After the vice president of university relations stepped down, Dr. Burlingame was asked to serve in that capacity, and as president of the Bowling Green State University Foundation for six years. In this role, Dr. Burlingame headed the university’s first capital campaign where he met donors and received a first-hand education in philanthropy. It was from that position that Robert Payton recruited Dr. Burlingame as director of academic programs and research for the newly formed Indiana University Lilly Family School of Philanthropy at Indiana University–Purdue University Indianapolis (IUPUI) (called the Center on Philanthropy at the time of its formation). 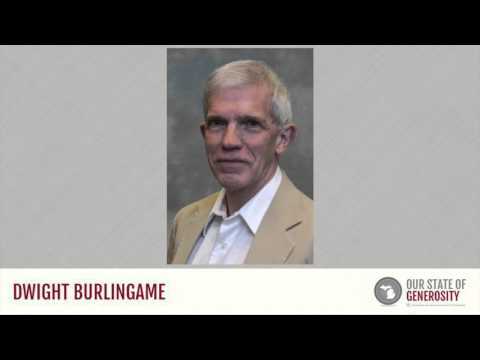 In 2013, Dr. Burlingame was named as the Glenn Family Chair, and he continues to be actively involved with the Association of Fundraising Professionals’ Research Council, the Association for Research on Nonprofit Organizations and Voluntary Action, and the International Society for Third-Sector Research. Dr. Burlingame has been influential nationwide, thanks to his research and expertise on the necessity of fundraising in particular. He has authored or co-authored ten books, more than 55 articles, and over 100 book reviews. A few notable examples of his work are: Taking fundraising seriously: Advancing the profession and practice of raising money (1991); The responsibilities of wealth (1992); he edited Philanthropy in America: A comprehensive historical encyclopedia (3 volume set) (2004); and Corporate Philanthropy at the Crossroads with Dennis Young (1994). Dr. Burlingame also served a six-year term as the editor of Nonprofit and Voluntary Sector Quarterly and 20+ years as co-editor of the IU Press book series on philanthropy and nonprofit studies. Outside of his writing, Dr. Burlingame has been prominent in the development of philanthropy education. He organized the bachelor’s, master’s, and doctoral programs at the Indiana University Lilly Family School of Philanthropy. Dr. Burlingame was brought on soon after the creation of the school and continues to teach prospective nonprofit leaders there. Dr. Burlingame served as one of the primary content advisors to the curriculum development of the K-12 philanthropy project of the Council of Michigan Foundations titled, Learning to Give. During its initial phase, he also provided the professional development required for K-12 classroom teachers to implement the Learning to Give curriculum. As a part of his voluntary contribution, he engaged in research and discussion with a small group of content advisors to define the learning outcomes related to philanthropy that defines the Learning to Give project. As of 2014, he continues on the Learning to Give Board of Trustees as the first non-Michigan representative. While developing Learning to Give, Dr. Burlingame also provided leadership and support to the implementation of a similar K-12 project in Indiana called Youth in Philanthropy Indiana (YiPI). While acting as both an author and an educator, Dr. Burlingame has also been a significant advocate, board member, volunteer, speaker, and consultant on topics including philanthropy, nonprofit organizations, development, corporate citizenship, and libraries. His tireless contributions to the field were recognized by the Lilly Family School of Philanthropy in 2013, when it named Dr. Burlingame a recipient of the Henry A. Rosso Medal for Lifetime Achievement in Ethical Fund Raising, as well as his selection as the Glenn Family Chair in Philanthropy. Dr. Burlingame was interviewed regarding his insights and experiences in working with Michigan’s philanthropic community and the Our State of Generosity (OSoG) partners. The following are selected quotations from his interview specifically related to the five organizing themes of the OSoG project. Our State of Generosity explores the past 40 years of Michigan’s philanthropy and its leadership, and is a joint effort of the Council of Michigan Foundations, Michigan Nonprofit Association, Michigan Community Service Commission, and the Johnson Center for Philanthropy. Our State of Generosity, powered by the Johnson Center for Philanthropy, is licensed under a Creative Commons Attribution-NonCommercial 4.0 International License, except where otherwise noted.